Giant of the cork production world, Portugal's Amorim, have unveiled what they are describing as an "innovative wine packaging solution." It is brand named 'Helix' and is the result of a four-year partnership between Amorim glass bottle manufacturer O-I apparently. It is basically a cork stopper with a rifled, screw surface that twists in (and out) of a glass bottle with an internal thread finish in the neck to match. 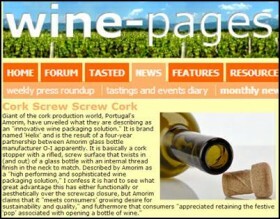 Described by Amorim as a "high performing and sophisticated wine packaging solution," I confess it is hard to see what great advantage this has either functionally or aesthetically over the screwcap closure, but Amorim claims that it "meets consumers’ growing desire for sustainability and quality," and futhermore that consumers "appreciated retaining the festive ‘pop’ associated with opening a bottle of wine."